You don't have to be rich to enjoy the gently rocking rest and relaxation a good hammock brings, as quality cheap hammocks are now widely available. These hammocks range from summery rope hammocks (including jungle-style mayan models), either with or without stands, through to single-point hammock chairs and super-light, travel-friendly nylon models. This guide will help you assess the models on the market today as well as providing tips, tricks and specific product recommendations to help you get the most bang for your hammock buck. Polyester is the more durable of these two fabric types. These classic rope hammock designs are what many people imagine when they think of a beach hammock. They offer great comfort, particularly in summer as their holes allow the breeze to flow through the gaps, keeping you nice and cool. Usually made from polyester or parachute nylon, these portable and tight-packable models are designed with camping and backpacking in mind. Note: you may have to buy accessories such as tree straps, rain tarps (tent-like top covers) and mosquito nets separately. These woven, cocoon-like hammocks from South America are a great eco-friendly choice. They are produced, often by hand, from very fine cotton thread, they are highly comfortable and they'll keep you cool in the sun thanks to their holey nature. Note: mayan hammocks are not always the most durable products (they can tear easily), nor are they usually very weather resistant. Don't have a strong branch or beam handy? You may need to buy a separate hammock chair stand. There are many hanging hammock chairs available for under US $50, including models from well respected brands like Hammaka (see the example further down this page). They can be hung outside (i.e. from a tree branch or deck beam) or indoors, providing you know where your roof's supporting beams are. It is easily possible to find new hammocks to buy for under US $50, in fact at the time of writing the cheapest hammock on Amazon costs just $11! This kind of price usually buys you a product designed for one adult, which you can either secure between trees (i.e. using tree straps, which may need buying separately) or mounted on a hammock stand. Most models at this price do not usually include a stand, although there are a few value-priced sets - featuring steel stands rather than luxurious wood - available from brands such as Texsport. Note: be aware that cheap hammock sets, and their stands, often receive mixed reviews from customers. So do your research (see below and the brand pages on the left), especially if you are on the heavy side as such stands and hammock materials might not always be strong enough to support you. The following 3 models retail for under $50 and have received the best 'average customer ratings' on Amazon, suggesting they are quality buys worth your consideration. At the time of writing, this beautiful family-size model by Rada, the largest handmade hammocks supplier in Mexico, had received 100% feedback from all the Amazon customers who rated it. Pretty impressive stuff. Handmade from 100% cotton in Yucatan, it is very breathable if not highly weather resistant. Its colored stripes also make it a whole heap of family fun. Note: Mayan hammocks like this do not typically feature 'spreader bars' at the ends, meaning you'll be 'cocooned' inside rather than lying completely flat. This army-style outdoor hammock in two-tone green and brown is designed with true portability in mind. It is made from super-thin and durable parachute nylon, meaning it is very light and also strong enough to support up to 500 pounds (more than most hammocks, whatever their price). Suitable for campers and backpackers, it features an attached storage pouch for quick packing; just fold or stuff it in and resume your trip with your travel hammock in a handy bag. Note: this model does not include accessories such as tree straps, tarps, mosquito nets etc. This single-person hammock is also made from parachute nylon and is part of The Pink Collection. This means Grand Trunk will donate 5% from every sale to breast cancer research (although the hammock is also available in other colors). Weighing just 1lb (450g), the Pink is highly portable and measures 10 feet long and 5 feet wide. Best of all it's simple - it includes everything you need to hang your hammock in just a minute. If you up the budget a little, you can of course expect more high quality fabric and parts. You are also likely to find more full hammock and stand sets available in your price range. At these prices you also start to find luxurious and very comfortable quilted hammocks from brands such as Island Bay, woven mayan products (i.e. 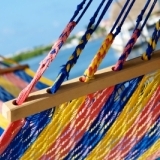 traditional Mexican, Brazilian and Nicaraguan hammocks) and even larger 2-person double hammocks. The following 3 models retail for between $50 and $100 (US) and have received the best 'average customer ratings'on Amazon.com. 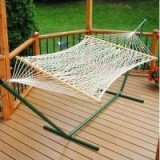 This popular hammock and stand set by Algoma features a cotton rope hammock and a steel stand. It can support up to 275lbs (125kg), which means it is effectively a single-person or 2-child product, rather than couple- or family-strength. This particular model features spreader bars at the ends, so you can lie relatively flat on your hammock without being cocooned inside mayan-style. This also means you can brown yourself nicely in the sun without getting a patchy, criss-cross type of tan. Note: it is best to take down and store cotton hammocks like this one when not in use, as wet or humid weather can cause the material to rot. One of the classiest cheap hammocks around, this comfortable tan-colored hanging hammock chair is quite portable too as it packs up into its own canvas shoulder bag (supplied). Made from durable polyester and featuring a built-in Ottoman (foot rest), this 'zero gravity' product installs in just 10 minutes and supports up to 350 lbs (158kg). Note: there is no stand included with this chair, therefore you will need either a branch/beam to hang it from (the connectors you need are included with the chair), or to buy a chair stand separately. This soft, raw cotton hammock is designed to fit two laid back people with ease (it supports up to 400 lbs/180kg). Designed by the well-regarded manufacturer Byer of Maine in a Chilean style it features hand-tied knots and a matching storage bag. As with the other cotton hammocks mentioned above, we recommend storing this model inside when not in use - particularly during wetter months when this fabric can easily play host to mold and mildew. You can also find great-value cheap hammocks by going the second hand or out-of-stock route, either offline or on. 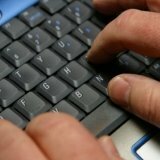 Try this quick-guide to other great-priced online suppliers . Do you own one of the beds above? Or maybe another hammock you bought for a great price? Tell our readers all about it.